Two kittens sleeping together on this Valentine's day card. 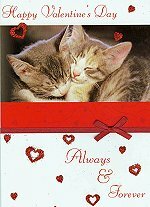 A red ribbon bow decorates the front of this card above the worlds "Always & Forever". Inside greeting: To the One I Love. Red envelope included.